Put protective tape under the belt moulding. Using a moulding remover, detach the claws to remove the belt moulding as shown in the illustration. Tape the remover tip before use. 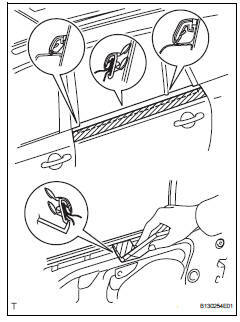 Be careful when removing the belt moulding as there are claws attached to the front and rear ends of the belt moulding.